Caddie Jim "Bones" Mackay apparently has high standards. 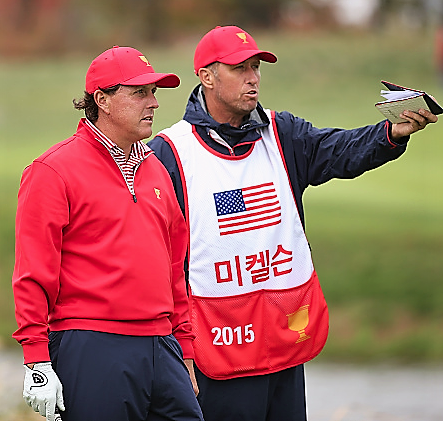 Mackay has not caddied for anyone since splitting with long-time boss Phil Mickelson (that's them pictured together) last autumn, but he recently accepted a gig to loop for the No. 3 player in the world, Justin Thomas, at the Sony Open next week. "Obviously this isn't a great place to walk when you've been in a boot for a while," Thomas told Golf Channel. "He thought he could go and he went the first two days and he was just a little slower walking. I told him, 'Look I'd rather you take as much time as you need to get it better and make sure that you're fresh come L.A., Match Play, Masters, whatever it is, I want him to be 100 percent again." The Thomas-Bones pairing is an interesting one. Obviously Mackay wouldn't come out of the broadcast booth for just anyone, and even more obviously, Thomas isn't just anyone. When he tees it up at the Sony Open next week, he will have failed to retain the Tournament of Champions title -- Thomas is 18 back going into Round 4 -- but he'll still have a shot to win his third Hawaii event in four tries. And he'll have a more-than-adequate fill-in on the bag to help him get there. "I think the world of Justin and I'm looking forward to working with him," said Mackay.